Let the arts and crafts begin! First, colorful eggs were made to hang on an Easter tree branch. 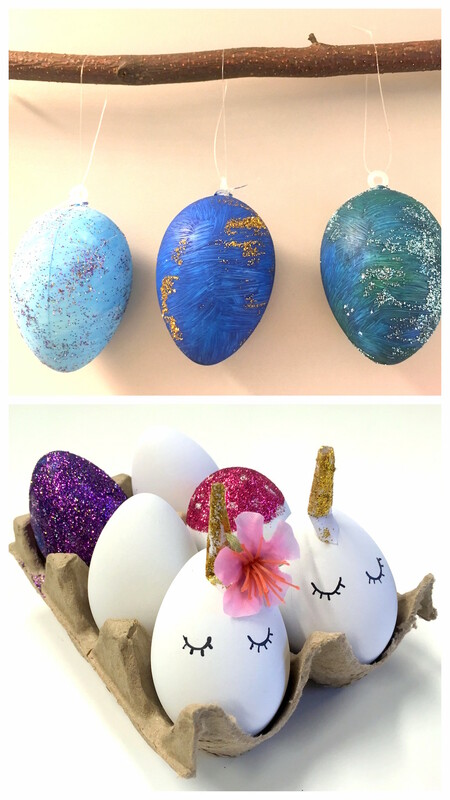 Because neither time nor artistic talent allowed for the creation of intricate works of art, we went with minimalism and designed single color Easter eggs with glitter highlights. 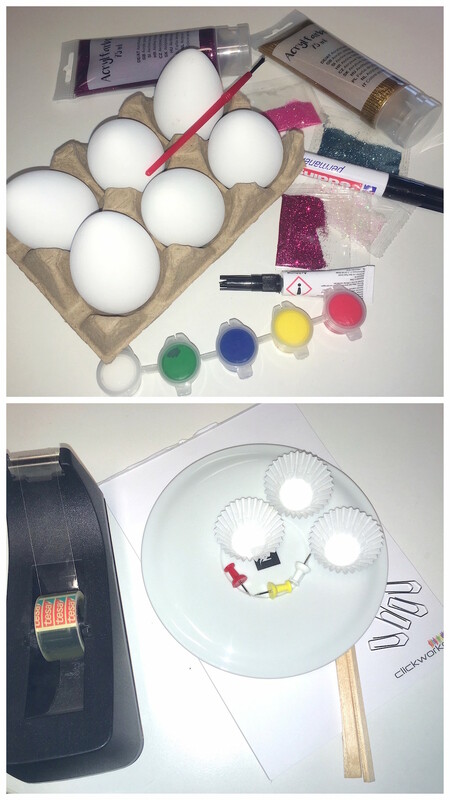 The plastic eggs were given a base coat of simple acrylic paint. After this was partially dry, the glitter came into play. It was simply sprinkled on some still damp sections, and therefore stuck only to selected parts of the Easter eggs. Because the hanging decorations went really quickly, we had time to also make a couple unicorns for the Easter basket. How do you like the results of our arts and crafts session? Regrettably we could only enjoy our Easter decorations for a week, because the clickworker office is closed from 3/30/18 to 4/2/18. We hope the colorful eggs helped get you in the Easter mood too, and could also serve to perhaps give you some suggestions for last minute decorating. Of course, we won’t leave you completely on your own over the holidays. In the coming days two Easter contests will await you here in the blog, and for urgent requests, the clickworker support is still available to you. Less time-sensitive inquiries will receive a reply after our short spring break. We wish you all a wonderful and happy Easter holiday! Dieser Artikel wurde am 30.March 2018 von mandy geschrieben.